The purpose of Web Accessibility is to attain universal access to the Web regardless of the software, or the user's device and ability. The Initiative of Web Accessibility began with this purpose, WAI (Web Accesibility Initiative), and it is promoted by the World Wide Web Consortium (W3C). W3C, intending to make accessibility measurable, developed “Web Content Accessibility Guidelines (WCAG)”, also intended to serve as guidelines for webpage design. They are 14 guidelines with checkpoints, each one related to a priority, so each priority indicates the need to check that point. Depending on the compliance to these checkpoints, different conformity levels are established: A, AA and AAA. Throughout the years W3C has improved the initial standard (WCAG 1.0). Finally in December 2008, a new version was published WCAG 2.0 to respond to users requirements. 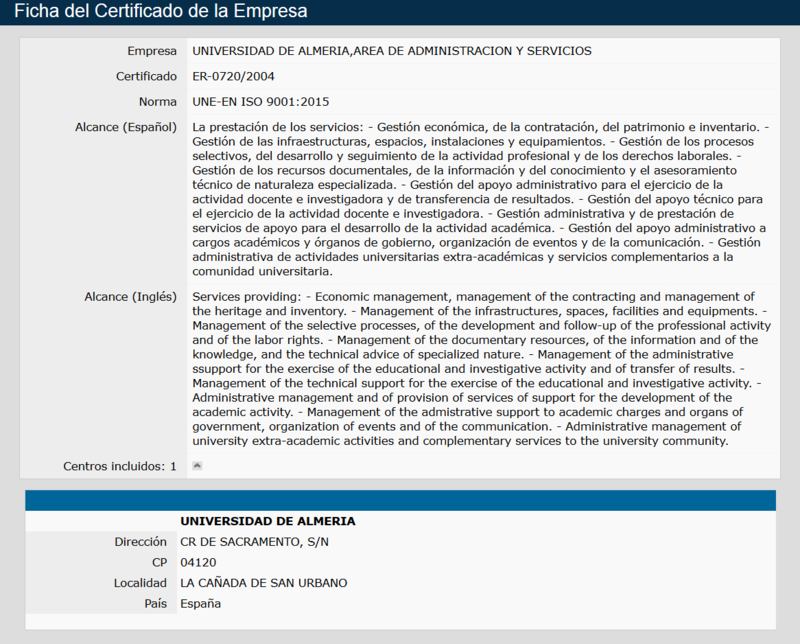 The University of Almeria is committed and has the obligation, according to the Royal Decree 1494/2007, of extending the level of accessibility to all University webpages. The Almeria University website has been designed to reach an accessibility of level AA according to WCAG 1.0, complying with all priority checkpoints 1 and 2. The University of Almeria, in its commitment with ongoing improvement and after publishing the new WCAG 2.0 recommendations, will be making the appropriate adaptations as this new W3C recommendation is enforced. The visual features (font type, font and background colour, etc.) are defined by CSS stylesheetsso the user may adjust the text to his or her preferences. But if the browser does not support stylesheets, all contents may be equally accessed disabling the CSS. The font sizes have been defined with relative units so the font size may be increased or reduced from the browser options. All pages have been designed with a clear semantic structure. By using HTML (H1, H2...) tags, the section headings have been identified, and also the titles, lists and other elements that are useful for a general understanding of the website. In this way, webpages have a clear structure not only for users who can see all the content, bul also for those who read the information with a screen reader, those who disable the stylesheets, etc. HTML and CSS codes used are adjusted to formal grammar in order to guarantee the correct vision of the contents in all browsers. All images published on the website have an alternative text, so people who, for several reasons, are unable to see them, may have a description of what they are intended to contain. If you find any problem accessing any content of the University of Almeria website, please do not hesitate to contact us. For this you can send an email to soporte.web@ual.es or use the contact form.